An extremely lively, fast-paced and interesting chat with guest moderator Daniel Midgley, @talkrtr, Lecturer in ESL and Applied Linguistics at Edith Cowan University, WA, and known to many through the Talk the Talk Podcast. @SophiaKhan4 and @McIntyreShona agreed with this approach however @McIntyreShona said her colleagues weren’t great fans. @aparnajacob’s students demand grammar everyday so she was excited to discuss a new approach. Ever tried to get away from grammar in your teaching? Do you teach in a way that puts something else in the foreground? @cioccas answered that getting away from grammar requires variety. @McIntyreShona suggested that manipulating text is the way for students to control their own language expression. What’s your language learning experience? Was grammar instruction helpful or did something else work better? @McIntyreShona and @cioccas learned languages using a variety of approaches, @Penultimate_K was expected to parse and translate, @lukeealexander had grammar-centric experiences however @aparnajacob acquired language ‘naturally’. Is it necessary to have a grammar focus in mind & design tasks accordingly? Or play it as we go and explain things as they occur? @lukeealexander believes focus on form and meeting students’ needs is important to consider. @McIntyreShona shared that course books are only 50% of her curriculum. @MeredithMacAul1 uses texts for grammar analysis and then asks students to use the language in their writing. @SophiaKhan4 suggested shining spotlight on grammar when it comes up in a meaningful context. @leoselivan shared that there is grammar teaching in LA however the practice is more distributed. @talkrtr encourages people to use http://wordandphrase.info/ for access to lots of examples. @cioccas said that she likes to teach the way she learns but understands that others learn in different ways so tries a variety of approaches. @aparnajacob suggested osmosis which @Penultimate_K also added immersion. @andrea_rivett took away that language is communication and culture and that eavesdropping was ok. @SophiaKhan4’s take-away message was songs which can be repeated and enjoyed. @cioccas added that learning the way that makes sense for you will keep you interested. Who wants to defend the grammatical approach? Does it still have any merit? Can you change @talkrtr’s mind on this? 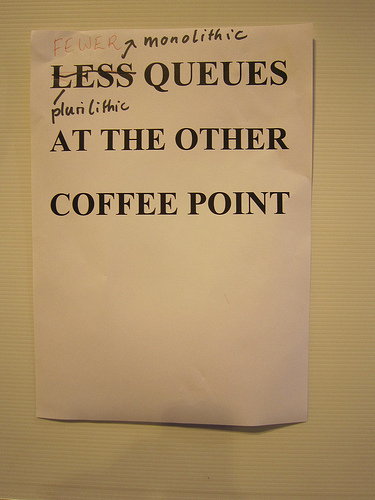 @leoselivan shared the following on avoiding grammar: http://www.theguardian.com/education/2012/sep/18/teach-grammar-rules?CMP=share_btn_tw. Throughout the chat, it was discussed why teachers teach grammar. Reasons included that students expect it and consider it serious; knowledge of grammar leads to communication; course-books include it; and it’s convenient. However, it was also pointed out that when course-books include vocabulary and collocations, they often lead to a grammatical point. @aparnajacob summed up this discussion by stating that we miss the ‘scenic route to learning’ by allowing grammar and course-books to take precedence. In summary, a focus on grammar is still widely used and by focussing on real-life language and contexts, lexical items can, and should, also be introduced. @lukeealexander shared that there were 4 systems in English – pronunciation, vocab, grammar and discourse, so give them equal time in class. From this Twitter-chat two ideas for future chats were put forward: @cioccas suggested ‘Getting away from course books’ and @andrea_rivett suggested ‘reflective teaching’. Thank you to guest moderator, Daniel Midgley ( @talkrtr )for joining the chat and for providing us with this thought-provoking discussion. For more food-for-thought, check out Daniel’s Talk the Talk Podcast. This entry was posted in Uncategorized and tagged #AusELT Twitter chat, awareness-raising, grammar, grammatical approach, immersion, lexical approach, task design, teaching and learning on June 11, 2015 by #AusELT.